An interactive exhibit, the event of a thread, by visual artist Ann Hamilton, connects people’s hearts, minds and memories through light, sound and movement propelled by visitors of all ages enjoying the large swings that anchor this exhibit. 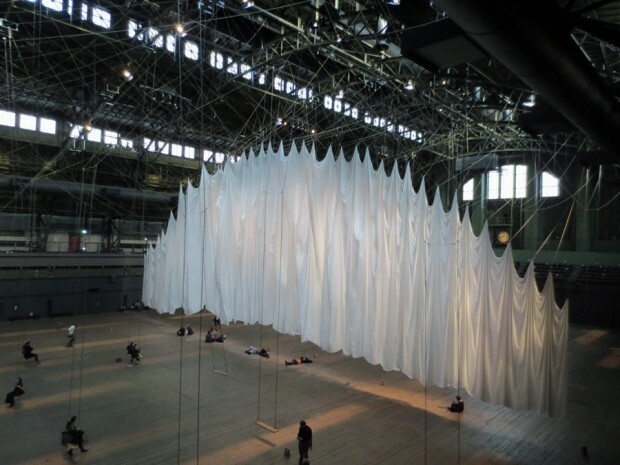 The swings are attached to a maze of wires above that connect to one very large volume of flowing white fabric moving up and down and back and forth, billowing like a sail in the wind dependent on the movement of the people on the swings. Artists quietly speaking random phrases into microphones with their words broadcast through radios hidden inside brown paper bags meant to be picked up or placed on the floor for your listening pleasure while you swing or just stand and watch or lay on the floor taking it all in. The exhibit is open to the public at the Park Avenue Armory in NYC through January 6, 2013.